A few moments later I was reading about an opportunity to live in the Museum of Science and Industry for a full month! After reading the Chicago Tribune’s article about this project I was hooked because I’m always looking for my next adventure. The museum wanted to find an adventurous, outgoing person with a strong interest in learning about science to be their “roommate” and share their experience through blog posts and Twitter. When I told my friends and co-workers what I was applying for the reaction is typically the same “Wait! What?!? Why?” The answer is easy, when else am I going to have a change to live in the Museum of Science and Industry without hiding in an exhibit? After visiting the museum on a “fact finding” mission, it occurred to me that I might not be able to handle the museum for a full month. Sure it would be a blast but a month inside a museum is a really long time. My doubts lead to nearly a month of procrastination and with literally 48 hours before the deadline decided I would regret it forever if I didn’t apply. With the help of my amazing friends Amit, Abbey, Sean, Brendan and Ashley, we pulled all of the pieces together for my application and submitted it on time. 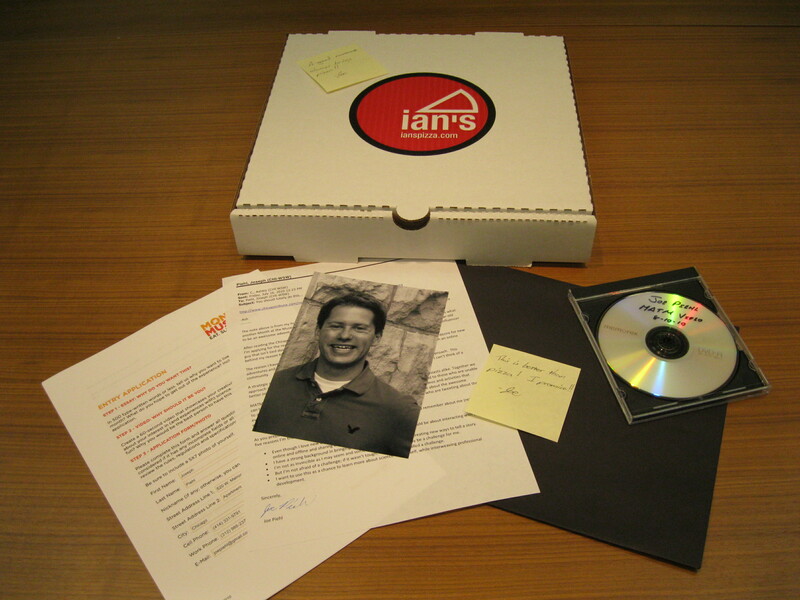 All of my materials were placed in an Ian's Pizza box because every good roommate brings pizza. Clearly, I wasn’t selected but since so many people were supportive, I want to share with you some information from my application. Applicants were encouraged to have fun with the process and I hope you get a kick out of a few highlights from mine. Name three of your favorite hobbies or activities. 1) Outdoor sports: I’m on two Summer softball teams, one Summer volleyball team, one Fall flag football team, I run outside almost every day (sometimes in the rain) and I learned to kayak on the Chicago River this summer. 2) Helping other people: I’ve spent more than 1 month on various service trips around North America. 3) Trying beers that I’ve never tasted: Every 2 weeks I buy a 6 pack I’ve never tried. Name three of your least favorite hobbies or activities (yours or others’). 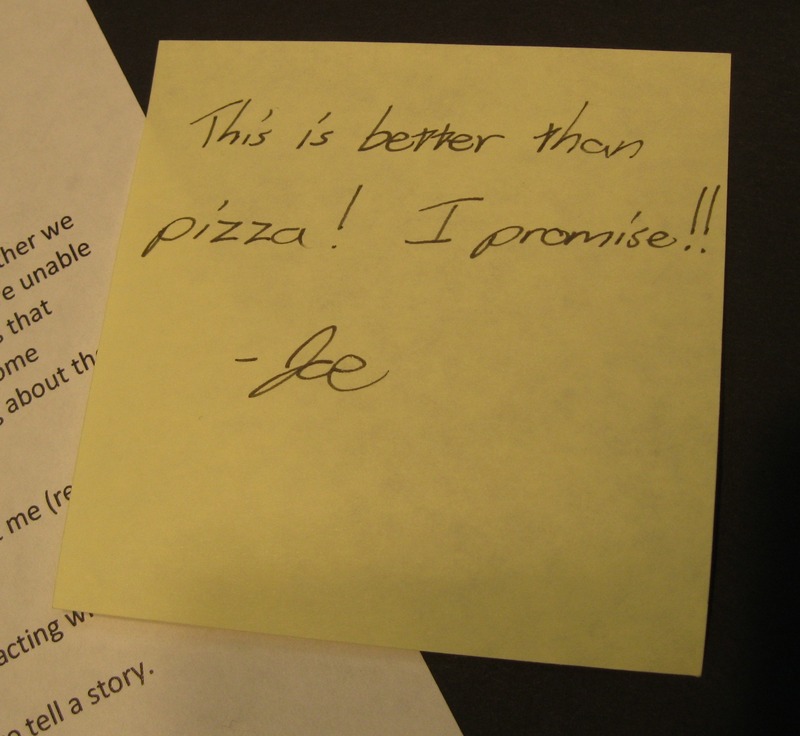 Except my application was better than the best pizza in Chicago. My least favorite hobbies / activities that I’ve tried at least once in my life: 1) Coin collecting – I like to collect stuff but I couldn’t get into coins. 2) Washing dishes – Unfortunately I have to do this every day. 3) Cleaning the family hot tub when I visit Milwaukee. FYI – Twice a year a hot tub needs to be drained, scrubbed and then refilled with water. This task is not fun to do in the winter. Let’s get this out of the way. Have you ever been convicted of a crime? Are there any outstanding… please describe the circumstances involved, including time, place and offense, as well as any penalties imposed. Now back to fun. List three adjectives that best describe you. How would you rate your knowledge and understanding of basic science relative to most people? The finalists were flown in from around the US for an in-person interview and on October 6th the winner, Kate, was announced. Two weeks later Kate was living in the museum. Even though she was blogging and Tweeting about some really cool activities, she wasn’t the only one that did some awesome stuff! My “Month NOT at the Museum” was also pretty unforgettable… but more about that in my next post. for someone who is in PR and is supposed to have impeccable grammar, there are quite a few errors in here. beware! makes me wonder why/how you got into PR. interesting….